ATV World Magazine – North America’s Best ATVing Magazine – No Riding on Private Land Without Landowner Permission! The Ontario Federation of Snowmobile Clubs (OFSC) and the Ontario Federation of All Terrain Vehicles (OFATV) urge all motorized riders to be responsible by respecting landowner rights. This respect starts with not entering any private land without permission. This means staying off of trails on private land that are not available to any rider during a given season (e.g. OFSC snowmobile trails during non-winter months) or that are available only for the use of a specific rider group during a specific season (e.g. snowmobilers during the winter). All OFSC Prescribed Snowmobile Trails on private land are shut down at the end of each winter and not available again until the next winter. This is because landowners have given permission to local snowmobile clubs to allow snowmobiles on these trails on their land, but only in the winter. This permission does not include any other riders or seasons. Unauthorized use of OFSC trails on private land in the non-winter months can not only lead to trespass charges, but can also result in a landowner permanently closing a trail to all riders for all seasons. Before entering any trail on private property in any season, every rider must have land use permission, either directly from the landowner or through membership in a provincial or regional organization or local club. When in doubt, check with the OFSC or OFATV to confirm where trail riding is available, acceptable and authorized in each season. 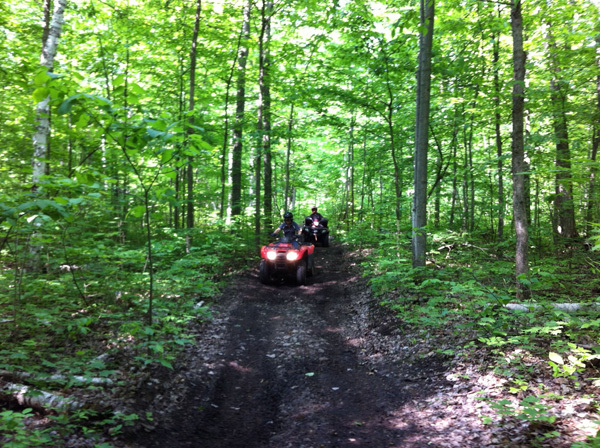 Ontario snowmobilers and ATV riders have enough shared or dedicated trails to ride legally in this province without trespassing on private land. Snowmobilers and ATV riders need to earn and keep the respect of local landowners and of their home communities by riding only where authorized and by staying on the trail. The best way to enjoy riding responsibly on authorized trails is to join your local club and ride with other club members. The Ontario Federation of All-Terrain Vehicle Clubs is a not-for profit, volunteer driven association that along with support staff provides resources to our member clubs so that together, we are able to strengthen the public’s perception and the position that our clubs strive to provide responsible, safe, legal, and environmentally friendly trails for riding all-terrain vehicles (ATVs & ROVs) in the province of Ontario.